Last Updated: 8/5/2012 | File Size: 508 KB | Price: $15 | Downloads: 168 | Developer: XaviWare Software Ltda. Content Advisor Password Eliminator is a program to remove Internet Explorer Content Advisor Password. this Password also known as Internet Explorer Supervisor Password. The password is usually set by the parents when they want to prevent their children accessing the adult content web sites. Another typical case is the boss or system administrator who is trying to limit and control the internet usage of his employees. There might be other cases when this password was set accidentally. 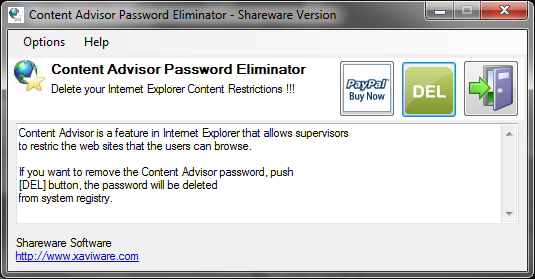 Content Advisor Password Eliminator will remove your Internet Explorer content restrictions. All versions of Internet Explorer are supported. Statement: First, please download the orginal installation package by clicking the download link. Of course you may also download it from the publisher's website. Using Content Advisor Password Eliminator crack, key, patch, serial number, registration code, keygen is illegal. The download file hosted at publisher website. We do not provide any download link points to Rapidshare, Hotfile, Depositfiles, Mediafire, Filefactory, etc. or obtained from file sharing programs such as Limewire, Kazaa, Imesh, Ares, BearShare, BitTorrent, WinMX etc. Software piracy is theft. If you like Content Advisor Password Eliminator please buy it.